Moscow (VNA) – Vietnam always welcomes and wishes to receive investments from Russia, especially in the fields of energy, oil and gas exploitation and refinery, industrial equipment and auto manufacturing, President Tran Dai Quang has said. 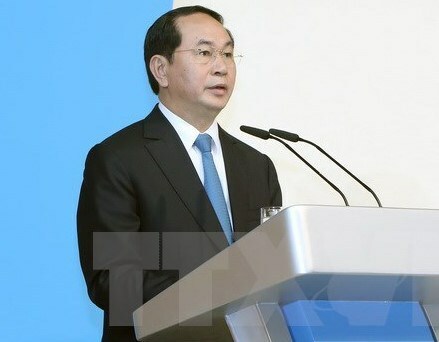 Addressing a Vietnam-Russia economic seminar in Moscow on June 30, the Vietnamese State leader called on the Russian side to create favourable conditions for Vietnamese firms to seek business opportunities in the Eurasian country in agriculture, food processing, IT, consumer goods, services, real estate, and mining. He hoped the free trade agreement (FTA) between Vietnam and the Eurasia Economic Union (EAEU), which took effect in October last year, will enable Vietnam’s textile products, processed agro-aquaculture products and seafood, wooden products, electronics, and consumer goods to access the Russian market. He also underlined the importance of the two sides’ business communities in promoting the bilateral cooperation, urging them to prepare for new opportunities. Vietnamese and Russian businesses should share new ideas and creative solutions with each other and become pioneering forces in fostering economic links, contributing to reinforcing and deepening the friendship between the two nations, President Quang said. Vietnam will make it easy for Russian businesses to seek and set up investment and trade ties with Vietnamese partners, he added. In his speech, Russian Minister of Economic Development Maxim Oreshkin stressed potential for the two countries to expand economic and trade cooperation, especially in energy, industry, oil and gas, and transport. The Vietnam-EAEU FTA creates a good motivation for stepping up economic, trade and investment links between Vietnam and Russia, he stressed, calling on both sides to focus on developing new investment projects in the time ahead. Agreements signed during President Quang’s visit to Russia will create an impetus for the bilateral cooperation in the future, he said, affirming that Russia is willing to facilitate the import of Vietnam’s fruits and aquatic products, as well as support the Southeast Asian country in developing electricity and mining industries. He expressing his belief that newly-signed projects will help lift two-way trade between Russia and Vietnam. The minister asked the two sides to outline a medium-term economic, trade and investment cooperation programme, affirming that the cooperation between the two countries’ businesses will contribute to developing the Russia-Vietnam Comprehensive Strategic Partnership in a sustainable manner.